A existed "MK755" Home security video doorphone system , there are 3 supervised zones in "MK755" system. This system entered market for 5 years, it is not enough to meet all customer's requests and market demand variations. Thus we are working out a brand-new Home security Alarm system. 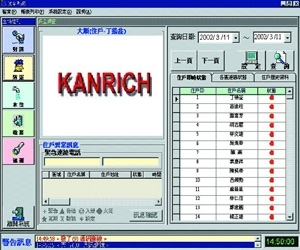 The whole system will be completed about July or August 2001. At present, a single Home Security Unit "S600" for each apartment (or a single house ) had been finished . 7 supervised zones (3 24hrs zones for gas / fire detector and panic, 4 zones for anti-burglar zones) in system; the 1st anti-burglar zone can be made a delayed set and a switch for starting the system. It can be set the delay time of arm/dis-arm separately, the setting time as 30/40/50/60/70/80/90/100/120 sec. And before 15/10/5 sec. of reach the dis-arm time, internal sounder will sound for reminding entry delay. 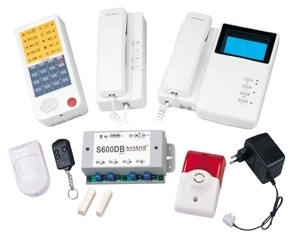 Arm / dis-arm anti-burglar system can be controlled by password/ remote controller/all kinds of card reader machines for controlling, you can choose one of them to arm / dis-arming anti-burglar system. The" arming anti-burglar system" to clear alert system, its intelligent design fully protect your password. You can setting the the Password from 1 digit to 8 digits. In case of evildoer forces you to dis-arm anti-burglar system, the "anti-forced function" can help you sending a SOS message to guard. The "Wireless Panic function" (optional function) can help your aged parents when they meet urgent status. Wear a remote controller, pressing panic button immediately on remote controller when they meet any emergency inside the house. At the same time, S600 will send an alarm sound and a SOS message to guard room. Let guard helps them in time. "Arming at home": A human function; arbitrarily choose anti-burglar zones as alert system from 4 zones.
" Mute": An intelligent design, the "mute" key will lose its function while the system is going to alert system for preventing evildoer invade your house and switch off sound. "Visitor notice": To start or no start as your choice. "S600"has doorbell function; just connect the wire of doorbell to"S600". 3 kinds of alarm sounds for choosing, you can set different alarm sound as on behalf of different status. Output way: by RS485, by dry contact or KANRICH own system. Output: (optional function) external siren, external emergency battery & the DC12V power supply for PIR, we prepare these functions for use in advance. Password: Its intelligent design of Password, you can setting the the Password from 1 digit to 8 digits. Note: Every one S601R can set max. 6 pcs Remote Controls (R.C.). If you request more than 6 pcs R.C., Please contact us. Note: Every one S602R can set max. 6 pcs Remote Controls (R.C.). If you request more than 6 pcs R.C., Please contact us. Notice: The adaptor only offers this home security system , PIR, siren and all accessories . Don't external connect the products which are not belong to this system , otherwise the system will be crashed. Alarm output:N.C, 30VDC, 0.2A max.